Shown with optional tire mounting bracket. Shown mounted on one of our galvanized trailers. ridged platform and side railings. Detach the center hinge and one 1200 lb. capacity ramp quickly becomes two 6 ft., 600 lb. capacity ramps. The design also allows the ramp to be folded in half when pinned together for easier storage -- 2 piece folding ramps shown separated. 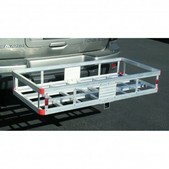 We have many more ways to customize your trailer! Design questions, let us help. Please visit our Design Help page to allow us to help y customize the trailer of your dreams. Keep your boat safe and secure with our new bow stops. With or without a winch this is a great feature you will be happy you added. Please contact us for more details. 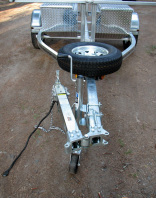 Remove 1 pin and safety pin -- tongue will swing back along trailer. Various lengths available to accomodate 3x3 tongues. Quick and easy hub and bearing maintenance. Grease gun fitting, spring loaded. Protective cover that slips over removed for clarity. 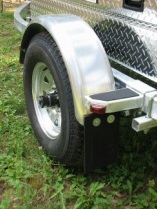 48" x 22 1/2 x8"
2 mud flaps = 1 set for rear of fenders -- can also add a second set to the front of fenders.